Can’t resist a quick selfie! It was a Wednesday the 12th of the 12th in 2012. Diego had excused himself from an interview to pull me out of work. It took a few goes before he managed to persuade me to come downstairs and get in the car. At the time we worked very close to each other so he was constantly bugging me to have lunch with him. For my job, lunchtime is the busiest time, so I could never meet him. Then and there I knew something good was going to happen. I certainly wasn’t expecting it until then. We had been together for 4 years, owned a property together for 2 years and I was very ready to marry when we brought our first home. However, as the years went on, I realised that it might not matter if we get married or not – I knew we were always going to be together for the rest of our lives and that’s all that mattered to me. He sped around the corner, determined to have it happen at a specific time and next to the water’s edge, but instead Diego had to pull over near the corner of Wallaroy Rd and Weeroona Ave in Woollahra so that he could propose to me at 12 minutes past 12. Of course I said YES! 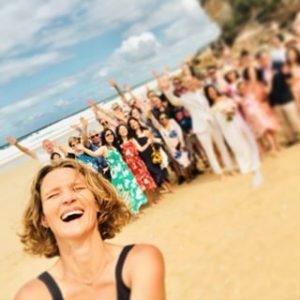 When we decided to start the process and get working on finding our celebrant I googled ‘Sydney Celebrant’ and found Meggan’s ad. She called me back that same day and we had a great chat about what I was expecting and what she could offer. She helped out a lot in the initial chat as I’d never spoken to a celebrant before and really wasn’t sure where to start! She asked a lot of questions I hadn’t thought of and gave some great ideas on how to incorporate parts into our ceremony which we felt were very important. After speaking to a few celebrants, it was a hands down decision to choose Meggan. She was so amazing, calm, peaceful, honest and attentive and had such a loving nature about her. The whole process was so easy and simple. It was the Christmas season with only a few months to work out the final run of our ceremony and so Diego, Meggan and I agreed to get everything organised within just two weeks so we all could enjoy the silly season! Meggan was there every step of the way, proofing, advising the best layout for the ceremony and even sending some lovely reminders and text messages to us. By the week before the ceremony we were completely confident and relaxed that the ceremony was going to be perfect. We have always had a rather strong connection to water, ocean, beach and outdoors and knew that we wouldn’t be married in a catholic church (much to our parent’s disappointment). 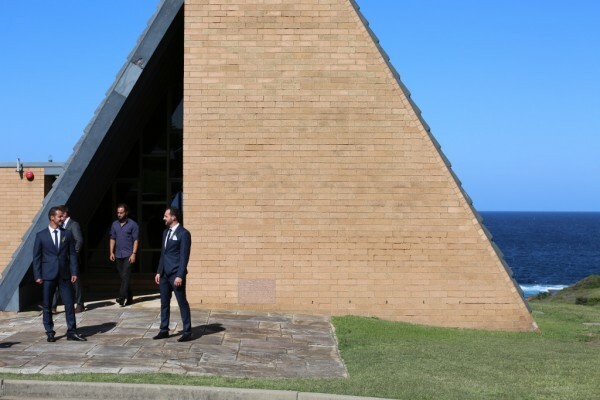 Our ceremony was held in the Nurses War Memorial Chapel in Little Bay, Sydney. It’s this gorgeous little chapel just on the top of the hill close to the beach where Diego and I often snorkel. We love it there. It has these gorgeous stain glass windows and it’s not too big, which made it nice and intimate. Also, because it’s indoors we didn’t have to worry about what to do if the weather wasn’t good. And it still had a great outdoor feel because we could see the ocean and the beach through the windows we were standing in front of. As usual, Meggan was amazing! I think both nerves from Diego and I completely went away when she started the ceremony! Now all of a sudden it was just Diego, Meggan and I. The ceremony was so effortless and organic, with Meggan working with our stuttering, crying and laughing. It was just so full of emotion for Diego and I, our family and friends. 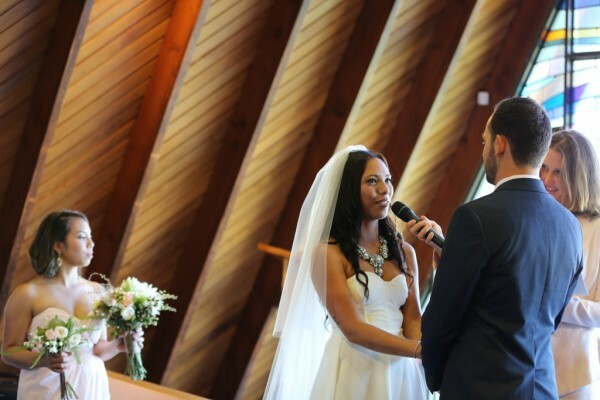 The best part for me was repeating the vows. I am usually an emotional wreck, but was surprised by the time the vows came I had not cried yet. When Meggan started to say the words I was to repeat I gave in and started to sob quietly and had to stop for a moment. I could hear Meggan’s voice slowly bringing me back just saying “Take your time, we’re in no rush.” It was so, so comforting to hear! After the ceremony everyone kept raving about Meggan and they all said the same thing – how engaging, calm and lovely she was. We got a close friend of ours, Gabriel, to play his guitar as I walked in. He played a song which he wrote for us. He also played while we were signing the legal docs ,but right at the end we blasted Beyonce’s ‘XO’ through Meggan’s great PA system. Alex Lindsey and his beautiful partner Kristen took our pics. They’ll be getting married next! Diego works with Kristen … and Alex has done some work with their company, mainly videography. We decided to use them because we absolutely loved his work from the videos he was making and he was really keen to get around to doing more weddings. It also meant that the budget wasn’t going to sky rocket! Just like most of our wedding choices, we really just wanted people who totally got us as a couple and could capture some great candid moments. It was strictly no cliché poses for us. I know it really works well for some couples, but we just wanted them to capture the emotions of the day and all our guests. We had our reception at the Sydney Opera House at the Marquee at Bennelong Point. It was perfect for Diego’s family, especially as they had come from the other side of the world! There was the picturesque view of the Sydney Opera House and Sydney Harbour Bridge and for as far as the eye could see to the east and north of Sydney. I absolutely adore Chiswick Restaurant in Woollahra and since it was the same company they were able to replicate the food and the styling there! I didn’t have to think about a thing! 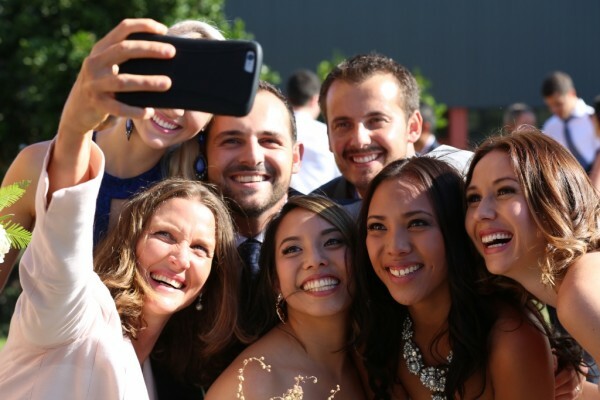 Our Reception was exactly like our ceremony – full of laughter, tears, spontaneous moments and so much love, with 57 of our family and closest friends. 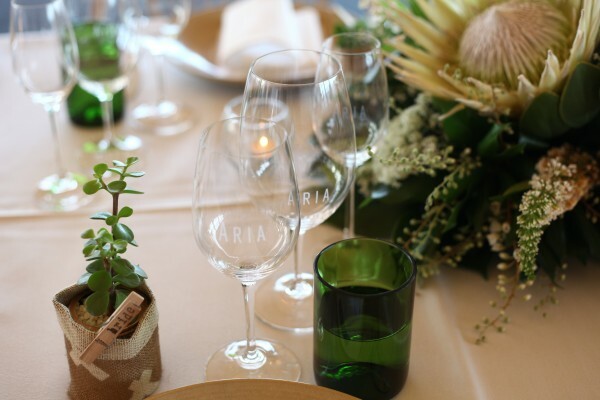 Our styling was done by ARIA Catering by Sarah-Mae Amey who owns Florals & Co and they were so on point! 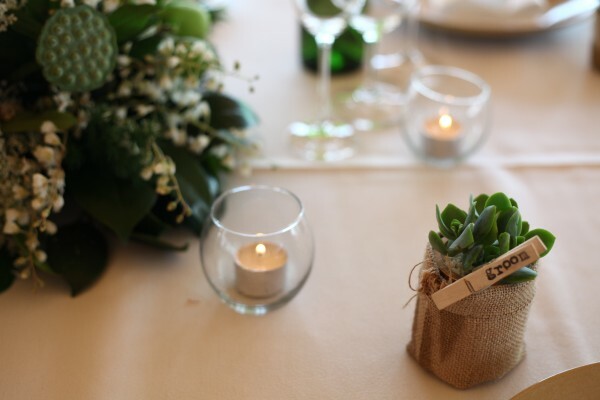 They had sorted everything from food, decoration, flowers, beautiful wicker chairs, lounge chairs and dance floors! My mother, my bridesmaids and I had made our own bouquets the evening before. I then gave my stylist a few notes about the type of flowers I wanted and she somehow (by coincidence) exactly matched our bouquet flowers we made! The staff there were outstanding! They were completely attentive and so discreet. Everyone just couldn’t stop raving out what fantastic service was! It really made the night! Just like everyone says- you barely get to eat at your wedding, which is true! That is probably the one thing I regret – not eating the amazing signature Moran Family Lamb Shoulder, but it was great to hear that it was everyone’s favourite! After the memorable speeches made by my dad, sister and Diego’s mum we danced the night away to Diego and I’s favourite songs. All on a playlist, so no DJ or band. Looking back this was, although a lot of work on Diego’s behalf – the best idea we had. We made sure that all the songs we wanted were played! Our reception ended shortly after midnight and we walked to the Pullman Quay Grand where we stayed in an apartment looking out on the Harbour Bridge. The best way to end the most perfect night! Since Diego and I got engaged, I knew I wanted a very, very simple dress – one with a lovely bodice and a sheath style bottom. It was so hard to get exactly what I wanted without spending over $10,000.00! I finally found the perfect bodice from Sass and Bide (The Thinker in Ivory). Now all I needed was the dress. My very, very talented mother agreed to make the dress off a pattern I gave her. She has done a few dresses in her time but mostly does quilting. I knew the pattern was easy for her and trusted she could do it. She did an AMAZING job and it made it extra special to be able to say my mother made my wedding dress. The ceremony was probably the most nervous I had been in many years! I guess for me, the ceremony was the most important part. Our vows, the readings, having our family and friends witness our union was really such a special moment for the both of us. Looking back it really set the whole tone for the day. The reception was amazing too – the impromptu parts were the best, like the bridal party dance that we made up on the spot! Any Tips For Brides To Be? My only tip would be to keep cool and remember the day is about you and your (soon-to-be) husband. It’s easy to get carried away with all the event planning (trust me I know – I organise events for a living), but the most important part is that you’re starting a new chapter with your lover and best friend. Everything else that happens that day is just a bonus! So enjoy the time you have with you family and friends and don’t get caught up in “the day”. After all, the important part of getting married isn’t the wedding – it’s everything that happens after it! Is there anything I wish I had done differently? No. The day was actually the best day of my life. Thanks Karen and Diego for choosing me to be your celebrant! I had so much fun helping you create your ceremony. From the time I met you in the park that first day I thought you were awesome. You were so relaxed, easy-going, fun and open to suggestions and it was such an honour and privilege for me to help you create the ceremony you wanted. 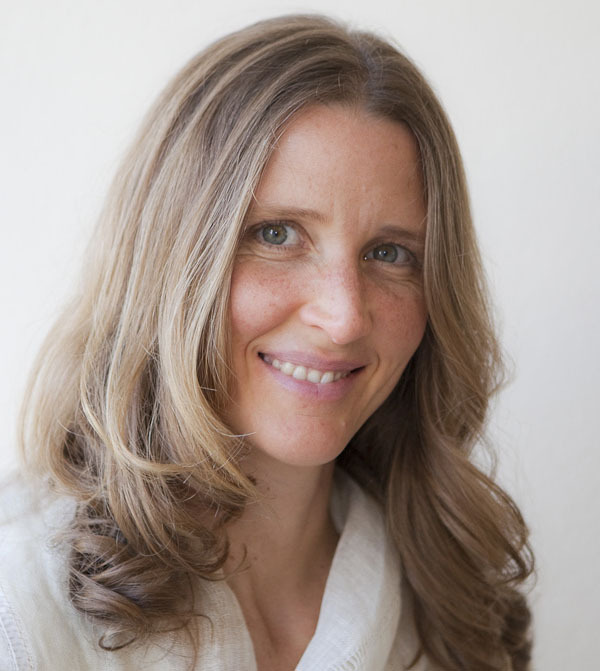 Meggan Brummer is a wedding celebrant based in Sydney. She’s also available to travel around Australia. Such a beautiful couple! I was honoured that Karen asked me to do her and her brudal party’s makeup. Its so lovely to work with someone so down to earth and genuine but heaps of fun. It makes my passuon of makeup artistry and fashion styling for weddings so much more worth it!! !